ASEAN-Japan Centre conducted a school-visit to Hagiyama Elementary School. 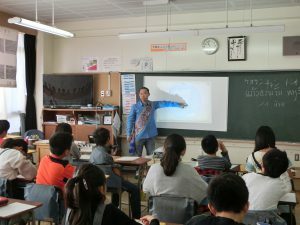 In the school-visit program, Laotian and Vietnamese nationals living in Japan introduced their home countries and their experiences in Japan to the 6th grade students in a human rights class on the topic of “foreigners in Japan”. Laotian lecturer shared his examples of what surprised him in Japan while comparing the life in Laos. He talked about difference in sales approach that comes from the size of the population and the difference of food culture that comes from Laos being a landlocked country and Japan being an inland country. Vietnamese lecturer spoke about the difficulty of finding a room to rent in Japan and Japanese society’s way of thinking towards foreigners based on her experience. Students learned not only about ASEAN nations but also about the life of foreigners in Japan.